Dungeons Runs were introduced in the Kobolds and Catacombs adventure. They can be accessed through the Solo Adventures menu, and they are free to play, without any kind of limitation. In Dungeon Runs, you select the class you wish to play as and are provided with a fixed, 10-card deck, and you will have to fight up to 8 bosses. There are no second chances, and if you die against a boss, you will have to start all over again. 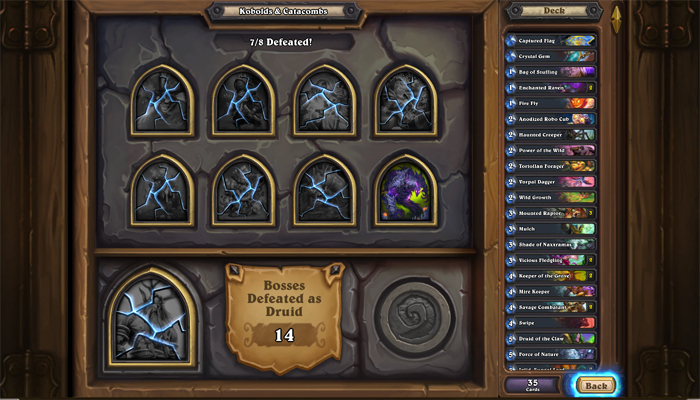 Defeating all 8 bosses completes the Dungeon Run. The interesting aspect is that with each boss you defeat, you will have the opportunity to add cards to your deck from the options the game provides you with (much like you would choose cards for your Arena deck). Moreover, the bosses you face are not fixed, so you will never know who you will face next. 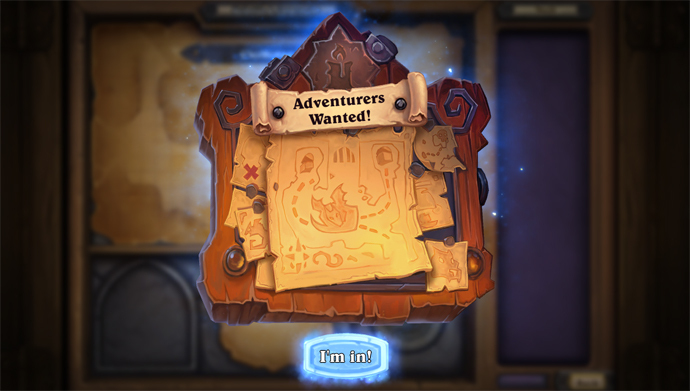 On this page, we will list all the known information about Dungeon Runs, such as which bosses you might face at which point in a Dungeon Run, what options you have for expanding your deck, and what rewards there are for completing Dungeon Runs. When you defeat the first boss, you will get to choose a treasure to place into your deck (treasures provide either a passive effect or simply a powerful card), and then you will also get to choose one of 3 sets of 3 cards each. These sets, called buckets, are themed (some relying more on spells, others on minions, others on certain schools of damage, and so on). 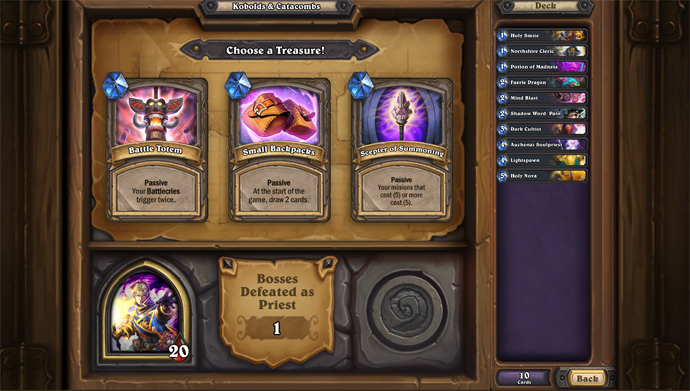 From here on, after each boss you defeat in your Dungeon Run, you will get to choose another bucket, and you after every other boss (so after the third, fifth, and seventh) you will also get to choose another treasure. Below, we list all the currently known treasures you can be offered. It appears that the set of 3 treasures from which you can choose is random each time. As an additional bonus, if you manage to acquire both Blade of Quel'Delar and Hilt of Quel'Delar, you will be rewarded with the all-powerful Quel'Delar! Below, we list all of the bucket themes that each class can be offered. Like with treasures, it does not seem that there is any significant pattern to the groups of buckets you are offered, although you cannot be offered the same bucket more than once at a time. Within each bucket, the actual cards that you will be offer differ wildly, being chosen from seemingly a large pool of potential cards. In other words, no two "Frost"-themed buckets will have the same cards offered (or at least, it is unlikely that this will happen). Finally, it is worth noting that it seems like choosing a bucket will increase the chances that it will appear again as a choice in the future, thus allowing you to form a more cohesive theme. 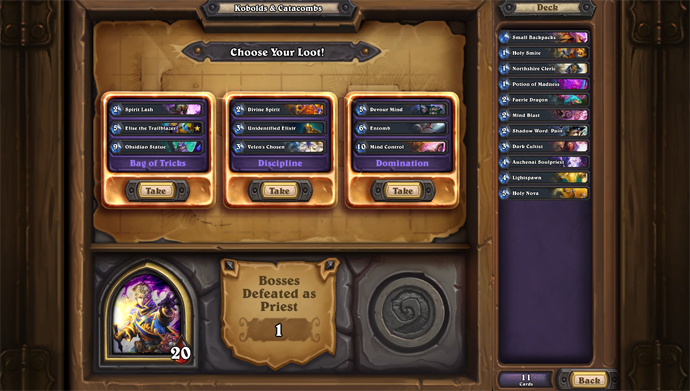 The difficult of the bosses increases as you advance through the Dungeon Run, with the Level One boss being typically extremely weak, whereas the final boss is usually quite difficult. Note also that your own Hero's health increases as you progress. The boss encountered at each level is random for each Dungeon Run. There is a specific pool of bosses that can appear on each level and some bosses are able to appear on multiple different levels with a different starting Health, Hero Power, and deck. However, no boss will appear more than once in the same Dungeon Run. There is also a separate pool of starter bosses and final bosses for the first and final level, respectively. The lists below show the known bosses that can appear on each level. There are 3 Kobolds and Catacombs card packs up for grabs through the Dungeon Run. You will receive them as rewards for defeating 1, 6, and 16 Dungeon Run bosses, respectively. Moreover, if you complete a Dungeon Run with each of the nine classes, you will be rewarded with the Candle King card back. 22 Dec. 2017: Added Kraxx boss guide link. 20 Dec. 2017: Added Shaman, Rogue, Warlock, and Warrior class guides. 19 Dec. 2017: Final 2 Treasures added. 17 Dec. 2017: Most encounters added, as well as Mage class guide. 17 Dec. 2017: Several Treasures added. 13 Dec. 2017: Treasure Vault and Overseer Mogark encounters added. 11 Dec. 2017: Treasure list finalised and information on assembling Quel'Delar added. 10 Dec. 2017: 6 Additional Boss listings added. 09 Dec. 2017: Additional Bosses added. 08 Dec. 2017: Kobolds and Catacombs Dungeon Run added. All key information that is known is available.